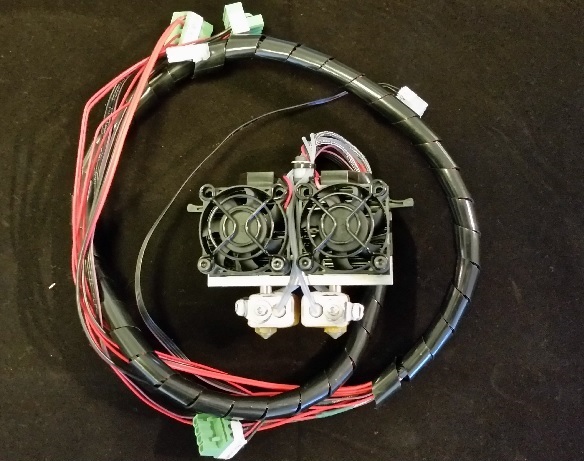 New MK10 dual-extruder assembly replaces the MK9 assembly on the Duplicator 4 and 4X. Includes 2 NEMA 17 stepper motors, 2 40mm fans, 2 fan guards, 2 spring-loaded gear drive blocks, 2 complete nozzle assemblies made of Mil-Spec components (ceramic-wrapped heating blocks, super-fine CNC machined nozzle cores, precipitation-free pipe inserts), and all the correct cabling for your Duplicator 4 and 4X. Pull out the old one and insert this new one for simple plug and play operation. Adjust the nozzle quickly and simple.